I have a 2280 winners which is new to me (this season). Have been viewing your posts weekly trying to absorb the wealth of info you guys deliver. Thank you very much for your input and advise given on this site it has been unbelievable. This is our first year on the big pond and I have been getting acquainted with my boat and all of the approaches to fishing salmon. I have a gramin which gives me speed. GPS and enables me to track my course, but is very lacking in marking fish. I also have a temp on one downrigger ball. I want to purchase a great fish finder but do not have much experience with them. I don't mind spending money if it is worth it. This is a family project and everyone is on board. Looking for your advise. What do you use? Hands down the furuno 620. Its easy to use and furuno hands down makes the best fish finders. I used to have nothing good to say about Lowrance, until this year. They have some impressive units, product quality seems to be much better, and their customer service is vastly improved. They gave me a great deal on an upgrade to a newly-released Lowrance unit when I sent my Eagle SeaCharter in for repair (out of warranty); that helped me to change my tune. But the units speak for themselves. For example, the HDS series is pretty awesome: Two-year warranty, excellent dual-frequency sonar, versatile GPS with decent built-in maps out of the gate. It supports RADAR, SIRIUS weather, and electronic sensors like fuel flow, fluid temp, engine interfaces, etc. You can hook multiple units together via NMEA-2000 and/or Ethernet and they can share things like waypoints, transducers, GPS antenna receivers, etc. I have a fuel-flow sensor attached to my HDS unit, and it can give me GPH, MPG, range, and fuel level. I don't have confidence in my normal gas gauge, and now I don't have to guess any longer about how much fuel I have left. I am looking forward to getting the Structure Scan add-on unit so I can do side scan and down scanning. I'm also thinking of getting a portable kit so I can use it for ice fishing, since it has great flasher-type options. I have also heard many good things about the new Humminbird units with side scanning. They may be an even better value than Lowrance, although not as expandable. It seems that Humminbird and Lowrance are the least expensive overall. This is only my opinion based on my own experience, so for those Raymarine, Garmin, and Furuno owners, please don't beat me up. what model Gramin do you have ? What model is that Frank? Put me in the camp that likes Furuno and Garmin. My boat currently has a Garmin chartplotter and a Furuno sonar, both of which are over 10 years old. 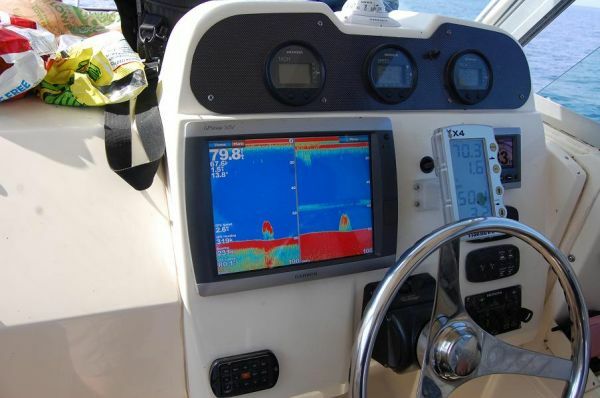 My only complaint is that the fishfinder screen is a CRT (TV tube) and is hard to see in the sun. When I eventually need to replace the fishfinder, I will look at Furuno first, but Garmin will be what I compare against. Equally important as the screen is the transducer. A properly mounted transducer is critical to good performance of any sonar. Do it right, or have it done by someone like Frank. As far as reliability, I have owned 6 Garmin products (4 GPS and 2 fishfinders - still own 3 of them) and the only issue I've ever had was that I had to do a system reset on one of them once. And they all get used (abused, actually) alot. Good Luck with whatever you decide. Chitown-Angler was started on February 10, 2003 and has received 207387931 page views in total since that date.